Build Enough Bookshelves: The Friday Four, Part 52, or One Whole Year! Yes, ladies and gents, this post represents the 52nd consecutive weekly Friday Four post! One entire year of interesting little tidbits on books, media, local events, and other happenings. Woo hoo!! Someone on a facebook group I frequent recommended an Australian TV series called Miss Fisher's Murder Mysteries. 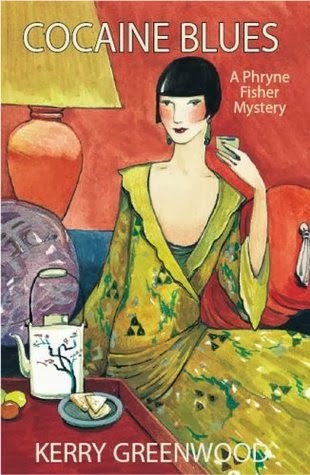 Phyrne Fisher is an independently wealthy heiress in the 1920s, after having served as a nurse in World War I, and in order to fill her days hires herself out as a "Lady Detective". The first season is available on Netflix and is really quite charming. The costumes are my favorite part, truly exquisite. The second season is only available on AcornTV - kind of like Netflix for British shows - so I haven't seen it yet, but I just discovered that the television series is based on a series of books! I check the first one, Cocaine Blues, out of the library yesterday and look forward to breezing through some quick, entertaining period mysteries. I was intrigued by this buzzfeed list of "32 books that will actually change your life". I heartily concur with the selection of The Diving Bell and the Butterfly, Crime and Punishment, and Sophie's World. I thoroughly enjoyed The Absolutely True Diary of a Part-time Indian, too. Under the Banner of Heaven's irresponsible and inaccurate depiction of Mormonism and its conflation of fundamentalist polygamists with the mainstream LDS Church certainly doesn't put it at the top of my list. I was pretty neutral on Life of Pi, I didn't care for Never Let Me Go, and I thought The Joy of Cooking was a bit of an odd inclusion to a list of "life changing" books. What are your "life changing" books? This blog post "3 Reasons I Quit Loving the Sinner and Hating the Sin" from back in October has stuck with me. I've never liked that phrase - "Love the Sinner, Hate the Sin" - and she beautifully articulates the problems with that mentality. I love her insight into the story of the woman being stoned for adultery and her observation that "Love the Sinner, Hate the Sin" is "made of 25% Love and 75% Sinner, Hate and Sin...that ratio is the antithesis of Jesus’ life, Jesus’ words, Jesus’ actions, and Jesus’ friendships. Does it really come as a surprise to us Christians that a phrase made of 1 Part Love and 3 Parts Sinner, Hate and Sin has failed rather spectacularly to deliver a love message?" This is the time to call out Neighbor! And Friend! And to love on each other with extravagant grace. This is the time to create Sanctuary and to be the Good Samaritan who had no standards when he helped the man by the side of road. Just none. Except generosity and love. And with that, I'm going to pat myself on the back and say "yay for me!" for not missing a single week of Friday Fours for a year. A book that actually did change my life: Lucifer's Hammer by Larry Niven. A comet hits the earth and people try to survive...kind of like teenage dystopian fiction without the teenagers or the angst. After reading that book early in my college career, I decided to change my major from law to engineering so that if the worst really did happen I would be able to help rebuild society.